Toby Ziegler’s exhibition at the Freud Museum takes its title from the final speech of Lindsay Anderson’s 1982 film Britannia Hospital. A series of sculptural and digital interventions in Freud’s final home weaved into the fabric of the collection. Focussing on the hand as motif, these interventions acted as props in a mise-en-scene which, while looking forward to a mechanically and digitally enhanced future for the human body, nonetheless insisted on its material, analogue, fleshly reality. Ziegler’s works were similarly hybrid, poised between a virtual, imagined future fast becoming reality and a corporeal present; a representation of the human form with its roots in the traditions of antiquity. 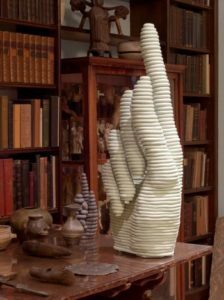 In Freud’s study, Ziegler placed several iterations of the same form, derived from a fragment of the Colossus of Constantine, a giant hand with a pointing index finger. Facetted, polygonal versions of the hand made of clear perspex and thin aluminium betrayed their origins in 3D modelling software, while coiled clay versions seemed to echo the logic of 3D printing. Elsewhere, two sculptures fabricated in facetted riveted Perspex suggested other points of reference. Illuminated by a huge bay window, ‘Martyrdom in the Swinging Sixties’, is a five foot high sculpture of the Christogram, the hand of Christ spelling out his own name, its plinth the table on the landing where Freud often wrote. On Anna Freud’s bed rested a sculpture titled ‘Self-portrait as a Klein bottle’. The Klein bottle was a paradoxical geometric form, a one sided surface (like a mobius strip), with no clear boundary between interior and exterior. For several years Ziegler’s work has been characterized by an investigation into the ways that images and objects accumulate and shed narratives, and Freud’s collection of antiquities could be seen to epitomise this. It’s easy to assume that Freud collected artefacts – statues of Egyptian, Indian, Greek and Roman gods, fertility symbols and phalluses – as symbols of specific human drives, but they must have gradually become familiar ornaments, absorbed into their environment; for his patients they must have had completely different associations again, sometimes functioning as triggers in their analysis. The works in this exhibition, though in situ for only a short time, imagined themselves as analogous to this process of absorption.